You’ve probably never heard mention of the thriving rock music scene in Northern Manitoba for obvious reasons: it largely doesn’t exist. Still – despite the fact that The Pas, which consists of the Town of the Pas, the Opaskwayak Cree Nation, and the Rural Municipality of Kelsey, isn’t Toronto or Vancouver when it comes to the sheer number of bands with brighter lights in their eyes – it would be folly to say that the less-populated areas of this nation can’t produce music worth listening to. 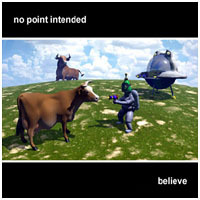 no point intended seem hell-bent on proving this true with believe, their first full-length album after releasing 2000’s homemade the 24 #*@%’en hours EP . A purely rock offering in an age glutted with rap-metal posers and electronica wannabes, believewill ultimately accomplish what no point intended set out to do: make a name for themselves and perhaps bring their music to a larger audience. Members Adam Halstrom (vocals / rhythm guitar), Quintin Bignell (drums), Steve Longworth (lead guitars), George Constant (guitars), and Ryan Proulx (bass) each stand as talented contributors to the overall sound, but what this band is really about, or should be about, is Halstrom’s vocals. Blessed with a voice that is full of energy and character, Halstrom will be the reason this band finds success. What too many bands fail to realize is the simple fact that thumping loudly on guitars has already been done; bands need to find the edge that sets them apart from the thousand or so other similar groups playing the same chords to the same beats. Our Lady Peace and the US band Live might still be your local bar acts if they didn’t have the strength of Raine Maida and Edward Kowalczyk’s beautifully unique vocals to help thrust them towards music stardom. Halstrom doesn’t have an overly powerful voice, but one with a distinctive flavour that sticks in your mind a day after listening to the recording. This is exactly the uniqueness no point intended need to stick out, and their vocals is what gives them that all-too-elusive edge. The title track, “Believe”, is Much Music-worthy, and reminiscent of the late ’90s band Sandbox, another Canadian rock group that achieved modest success on the strength of their vocal/alternative-rock blend. The song sets the tone for what follows throughout the album: tight production, with guitars that are content to exist as a building block for the overall sound rather than overtaking the song as the most visible element. Don’t get us wrong – no point intended’s instrumentals are superb – it’s just that it’s refreshing to see a guitar band that are more concerned about the big picturethan the individual members’ egos. Other notables on this album include the elegantly honest “Better Without Me”, the catchy “Flirty Beloved”, and the aptly named “Verbal Whore”. Every song stands as a carefully-crafted pop/rock story; every song a testament to what can come out of a group of talented individuals willing to dedicate a lot of their time, effort and money to make their music work.believe was a year in the making, and an excellent business card for a band destined for something larger. Watch out for this one….